Israeli soldiers injured, Friday, three Palestinians with live fire, and caused dozens of suffer the effects of teargas inhalation, after the army attacked dozens of Palestinian protesters, marching in Hebron city, the al-‘Arroub refugee camp, in addition to nearby Sa’ir and Yatta towns. 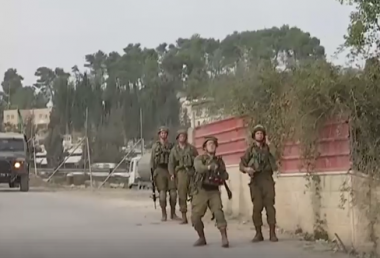 Update: The soldiers abducted five Palestinians in the al-Manara Junction, in Hebron city. Medical sources at the al-Ahli hospital in Hebron, said the soldiers shot two young men with a live round in their lower limbs, causing moderate wounds, before he was rushed to the emergency unit. They added that the soldiers also shot another Palestinian with a live round in his thigh, before he was taken to another hospital in the city. Medics also provided the needed treatment dozens of Palestinians, who suffered the effects of teargas inhalation, and moved several others to hospitals for further treatment. The injuries took place after the army resorted to the excessive use of force against Palestinian protesters in Hebron city, the al-‘Arroub refugee camp, in addition to the towns of Sa’ir and Yatta, and fired many live rounds, rubber-coated steel bullets and gas bombs at them. In related news, the soldiers attacked dozens of nonviolent Palestinian protesters in the al-Lubban ash-Sharqiya village, south of the northern West Bank city of Nablus, causing several injuries. The soldiers also attacked dozens of Palestinians who marched from al-‘Azza refugee camp, to the northern entrance of Bethlehem city, in the occupied West Bank.